A couple are embracing in a doorway during a rainy night. Elsewhere, a speeding van is driving down the expressway, containing four worried-looking men- one of which is clutching a small disc. Suddenly, a scary-looking guy pops head in front of the winshield from above. It's a group of people wearing hockey masks- they break the windows and reach inside. The car begins to careen out of control. Back at the doorway, the couple talk and begin to seperate- the girl has a report to work on, and the guy, Masato, teases her about her computer being her lover. On the expressway, the attackers reach in and kill all the van's occupants. A dead guy drops the disk he had been carrying, and a killer reaches in for it, but the car is too far out of control and they jump off. At the apartment, the guy is on his motorcycle leaving, while his girlfriend is standing nearby- he pauses to wave, when the car breaks through the railing and falls onto him from above. (Me: Damn.) The girl watches in shock as everything goes up in flames, except the disk lying on the ground nearby... She drops her umbrella and screams his name. There are four pictures on the wall, slashed in half. 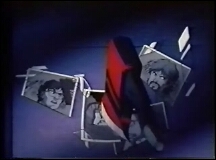 They are photos of the four men killed the night before, and an axe slams into the wall through them. There are a bunch of scary-looking guys polishing weapons listening to an angry-sounding old guy on the phone saying that he didn't just want the guys dead, he wanted the MO. One of the killers says that since they're just killers, someone else should get the MO for them, but the old guy threatens not to pay without the MO's retrieval and hangs up on him. It's daytime, and the girl, Michiru, is walking with a friend, who is seeing if she is okay. Michiru is downcast, but doesn't say a thing. Down the street, there is a flower shop with girls crowded around the doorway. The friend looks excited and says they should go, since "they" are all together today, and drags Michiru to the store. Inside, one of them (Aya) is watering plants; another (Ken) is misting a few, a third (Omi) is moving plants around, and the last (Yohji) is sitting at a desk and winks at them. The girls are pressed up against the windows admiring the guys (who wouldn't?) while in the corner, an old lady is stroking a happy-looking cat. However, all the girls are pretty much only interested in looking/flirting with the guys. A pair of girls try to help Omi, then start getting into a fight over who Omi belongs to. A third girl walks by and takes the pot from his hands, saying that she'll buy it as a present for Omi. One of the girls identifies her as Takaki Ouka (Ouka is her first name) and think that she's very stuck up. 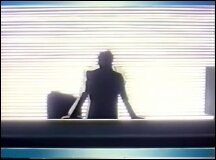 A white screen appears- it's a shadowy figure standing at a desk. 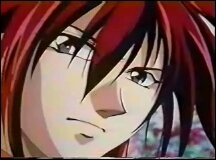 He says that he has a mission for them, and the target is a group called Sukaruku. 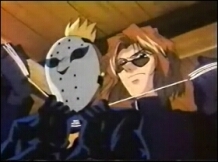 Images of the four killers in both their killer's disguises and normal appearances come to the screen. The man explains that they were trained all over the world, and were killing innocent people. The screen closes in on the speaker's mouth, who gives them an order- "White hunters in the dark! Hunt the tomorrow of the dark beasts!" The people watching are hidden in the shadows, showing only a little bit of their faces, but it appears to be Youji, Ken, Omi, and Aya. A woman (Manx) comes down the stairs and asks if everyone will do the mission. 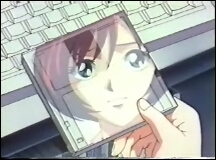 At the library, Michiru is working on her computer when she imagines Masato's face on her screen. She begins crying and asking why he had to be in that accident, when she suddenly thinks of something and looks up the news on her computer. It says that special political reporters from the Tohou Newspaper were in the car, and begins reading the article. But then she hears a noise behind her and asks who's there, but the room is empty. She resumes her work, but then gets that feeling that someone is there again, but no one answers. She packs her bag and runs out of the room, looking behind her as she goes, but as she passes by the stairs, a dark figure grabs her hands and stops her. She starts screaming for help, but it's actually a nerdy-looking guy who apologizes for surprising her and asks if she's alright. 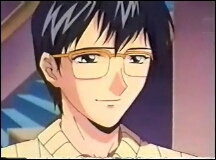 At first, she imagines that it might be Masato, but it's just an ordinary-looking guy with glasses. They end up going to a cafe to talk, where the guy says that he'd read the article about the reporters who'd died in the accident as well. But then he says that they'd been killed on the expressway and the car had fallen- when she asks why he'd think that, he explains that they'd gotten some sort of secret and were trying to get away when they were killed by someone that didn't want to be exposed. He tells her how he thought it was strange nothing was found- like a floppy or an MO disc. Michiru says she doesn't remember anything like that, when she recalls the disc next to her as she knelt in the street crying. The man insists that the MO disc is the key to solving the mystery, and holds her hand in his own, offering to help her, since the reporters had been killed because of the disc. When she looks shocked, he introduces himself as Kimura Akihiko, and says he'll protect her. She fumbles to introduce herself when he says he already knows who she is- Hayasaka Michiru, famous in school because she was the youngest to win the Genius Hacker contest. She says she's not a genius, and he comments how modest she is, and they both begin to laugh. Outside, the black car was waiting again and drives off, but there was someone outside on the street- Yohji, who turns around with an serious look on his face. 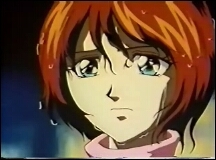 At home, Michiru is holding the MO disc in her hand, thinking about how four people and Masato had died because of it. She puts it into her own computer, where it asks for a password, but she doesn't know anything about what the reporters were working on to even guess. The doorbell rings, and it's actually Kimura, who brought information about what the reporters were investigating. 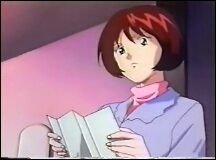 They both go through the information, where Michiru learns that they were investigating the Minister of Energy, then looks for something that could be the password and continues reading. Kimura glances at her, and his glasses shine as he has some unreadable expression. The next day, Michiru is asleep at her computer, when she recieves a letter at her door. The noise wakes her up, and she reads the letter and is shocked. She takes it to Kimura, who reads it- "If you want to know the fact of the affair, come to Villa-White at Mount Takeda." He thinks it's dangerous, but Michiru wants to go. He objects, but she says she'll go if he goes with her, and he says that he'll accompany her. She leaves to prepare, and Kimura gives the note a hard look. They are driving through the snowy woods when they arrive at Villa-White, a log cabin out in the woods. Michiru carefully opens the door when a figure runs right past her and slams it, startling her into Kimura's arms. It's Omi, who's carrying a basket and is equally as surprised to see Michiru there. 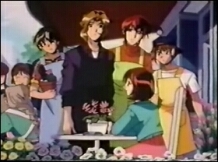 Yohji, Ken, and Aya open the door, and Michiru is surprised to see them as well. She explains that she got a strange letter and shows it to them. Yohji reads the letter and exclaims that he wrote it- and it was Ken's fault for delivering it to the wrong address! They get into a small arguement over it, and when Michiru says she doesn't understand, Ken walks away and explains that it was meant for one of Yohji's old girlfriends, since they'd had a misunderstanding. Aya explains that it's just a personal affair, and she's really shocked that it hadn't been about the disc or reporters. Omi apologizes and says they were just here for a holiday. Kimura asks who they are, and she explains that they're from the flower shop. Aya asks them to stay the night, and the others say that if they've already come all this way, then they might as well spend the night. Youji, of course, complains that he doesn't like the fact that she's here with a guy, and then blames Ken for that since he mis-delivered the note. ~_~;; The two travellers agree, and Omi is excited to have them over. Yohji escorts Michiru inside, and when Kimura is left alone with the other three, Aya asks him whether he's worried about something. 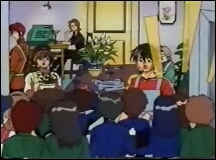 Later that night, Yohji is sitting with Michiru, Omi, and Kimura, dragging out embarassing stories about Omi. Yohji gets up and complains that Aya's making him starve by being late, and Omi says he's just bringing junk food over. 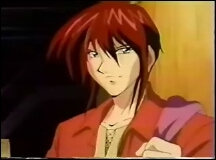 Then Omi gets a phone call from Ken, and passes the message on to Yohji- they're having car trouble and need help. 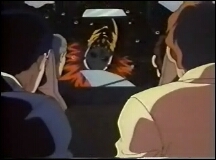 Yohji and Omi leave to help them out, and ask Michiru and Kimura to stay until they get back, and drive off. Michiru goes out on the balcony and says how much she's enjoying herself, and Kimura reminds her that she should find the password. She promises to go work on it and heads back inside when she notices a shooting star. She turns back to admire it, and Kimura stands there with his arm around her shoulder. When she wonders about why it's so pretty, he tells her it's because she's there watching it with him. She's very surprised, and he leans over to kiss her, but she suddenly figures out the password and shoves his face away. (Me: *laughs*) She thinks it's has to do with stars- star dust, since one of the biggest problem for the Minister of Energy is nuclear dust. When she types in "dust", the disc is unlocked, and she manages to decode the data, revealing bribery plans for the nuclear dust. Just then, however, Kimura smiles- and it's not a nice smile. She traces the plans and figures out that the Minister is at the head of these plans, and Kimura congratulates her- and sends and axe at her, grazing her face and striking the wall. While taking out the axe, Kimura explains that the Minister would be in big trouble if anyone found out, so he'd hired professional killers to take care of the reporters. 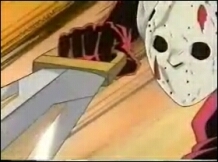 When he removes his glasses, showing the scary eyes, and holding the axe, it's very clear that he's the same killer from the beginning of the episode. He thanks her for solving the password and pushes her aside, when the other three killers show up, dressed in black with their masks. They explain that with the disc, they wouldn't have any trouble retiring, and Kimura puts on his mask, and all of them laugh evilly. 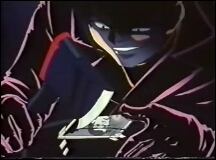 Michiru starts crawling away, and killers follow, saying how they needed the information to blackmail the minister... But she's not alone, since Yohji is behind a door or wall, watching. 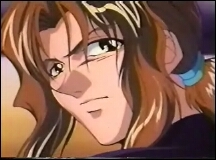 Michiru is still surprised that he'd lied to her, and Kimura answers that "liars die in this world". Aya is watching from the darkness as well, and Kimura says he'll let her choose what weapon she'll be killed with. She backs away further and falls onto the bunk bed, and he tells her that since it's the only cottage deep in the mountains, they'd only return to find her body. One of the killers lunges at her with his claws, when Aya, Ken, Omi, and Youji act on some unseen signal, and the lights turn out. Michiru squeals and falls, and the feathers sly, but when the lights come back on, Michiru is gone. The killers hear something to the side and see Michiru jumping off the balcony, and chase after her. Two of them leap off the balcony as well, but an arrow catches the third one one in the chest. The last pauses in surprise, when a cord wraps itself around his neck and drags him back. It's Yohji, dressed in black, who tells him that if you make a girl cry, then you'll pay for it later. After stringing him up above the ground, Yohji runs out onto the balcony, where Omi, holding a crossbow, gives him a thumbs-up. 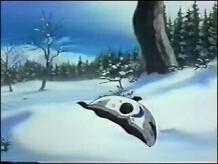 Michiru continues running through the snow, and the killers split up while chasing after her. When one of them cuts her off and leaps at her with his claws, "Michiru" pulls off her wig- it's really Ken, who smiles and gets him with his claws. The wind and snow blows as the last killer (Kimura) realizes he's alone- he pauses and looks up, seeing a dark figure standing on a hill before him. He asks who he is, and Aya answers, "Weiss. The white hunters." He's armed with a sword at his side, and Kimura realizes that they'd used her as bait. Aya reminds him that he himself had said liars would die in this world. 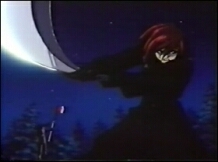 Kimura charges him in response, and Aya simply flicks his sword out of its sheath and draws it as Kimura runs toward him, killing him. His mask is split in half and falls off as he lay on the ground, and Aya stands there looking at the body. The next morning, Michiru wakes up with light shining on her face- she pulls away the small door to the place in the wall she'd fallen into, and sees the body of the strangled killer hanging in front of her. She turns away and grabs the disc, running out onto the balcony- where the body of another killer with an arrow in him lay. Michiru stands there in horror, and then screams. Out in the snow, half of Kimura's mask blows in the wind. The news is playing on the TV in the flower shop, and the reporter is explaining how the Minister of Energy resigned on suspicion of taking bribes for nuclear dust. The guys are tending the shop as usual, and Omi is on the phone with Michiru. He tells her how frightened they were and how they couldn't do anything, were skared and shaken, etc., which made them miserable. But Michiru starts talking about katakuri (the flower arrangement) and how it's fine- and all the guys suddenly look up. She's sitting at a table outside the shop, and when they approach, she tells them to cheer up. She hands them the katakuri, which brings a smile from the guys, and Michiru laughs, her hair blowing in the wind. Preview: Omi is disguised and working on a computer. He says how bad Human Chess is, where people must fight eachother until they die. Ken won't forgive them until they're dead, and Youji isn't interested unless it involves girls over 18. Aya says he'll take any mission, and Manx tells them that they've never actually seen the target before- the only clue is a scar on his face. Back to the episodes index.